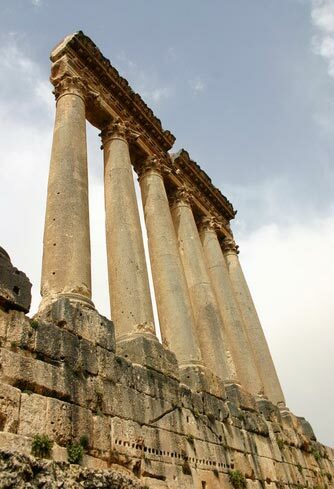 About 6,000 miles west from Angkor Wat, across the continent of Asia, is Baalbek, Lebanon, northeast of Beirut in the Bekaa Valley. There stands another ruin of the same type of construction using immense, often interlocking, stone blocks. The original structure, of which only the foundation exists today, dwarfs a very large temple built by the Romans in the second century B.C. using just a portion of one wall of the original construction. In the above photo, the last few original columns with their entablature measure nine feet in diameter and stand 90 feet tall giving some idea of the size of the stones in the wall beneath. 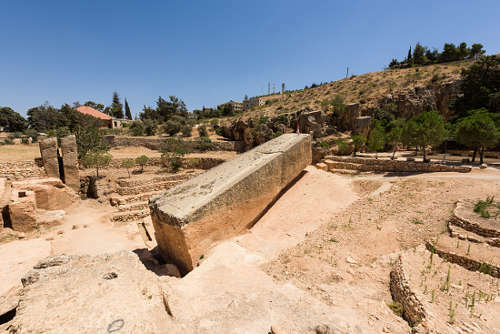 The mystery of Baalbek, as with many of the other sites under consideration, concerns the massive foundation stones upon which the Romans built their Temple of Jupiter in more recent history. Some of the precisely shaped and positioned blocks of the original temple are more than thirty feet long, ten feet wide, and fourteen feet high, weighing 450 tons each. Above these stones are three much larger stones known as the Trilithon, over sixty feet long and of similar girth, weighing up to 800 tons each. All of the stones are straight and perfectly squared. In a limestone quarry a quarter mile from the temple, and ready to be moved, sits the largest tooled stone found today. It is nearly 70 feet long and weighs an estimated 1200 tons. These stones are an enigma to contemporary scientists because of their quarrying, transportation, and placement methods.